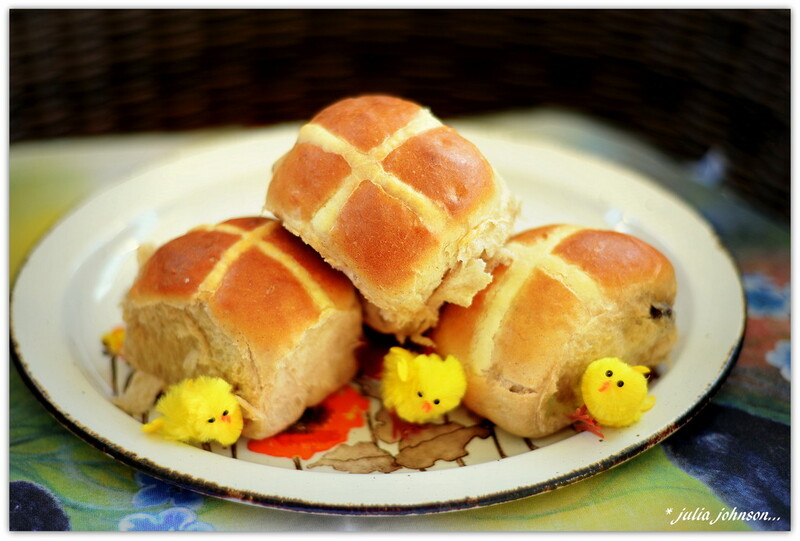 Happy Easter all my 365 friends... Batch one of the Hot Cross Buns were made this morning .. It always brings back happy memories of my childhood when I make bread and I think I should do it more often .. My Mum was the best bread maker .. and a fresh loaf of bread was made every day .. and nothing better than a slice of fresh bread and strawberry jam .. Easter never goes by with out about 3 batches of buns coming out of my oven.. going to have to spread it out this year as my daughter and her family are all away so requested theirs for when they return ..
Just off to go and visit @dide at her camping site .. so best take some buns to them .. Tags hot, cross, easter, buns. They look delicious. Wish I could bake like that! They look yummy! Fun addition of the chicks! They look fabulous Julia, we will be having them for breakfast too but they come fro Woolies ;-) Have a wonderful Easter. Now they look much more delicious than my feeble attempts. Last time I tried to make hot cross buns, I went into labour with my third child who was of course born on Good Friday! I still remember coming home with a new baby and finding very stale rock-hard buns in the cupboard! Never again I said! Happy Easter - and well done with those buns. These look very very yummy ! Wow what wonderful hot cross buns! They look delicious! Very clever - I’m afraid I cheat and buy them! Happy Easter!